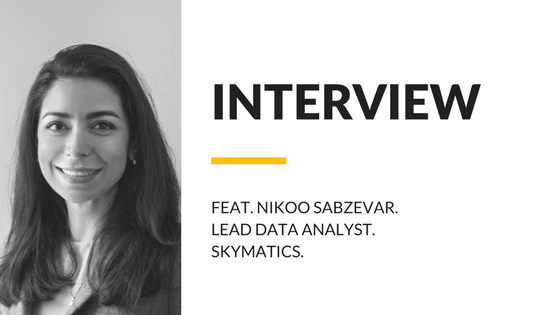 I’m Nikoo Sabzevar, Lead Data Analyst at Skymatics. I was born and raised in Iran and got my Bachelors and my first Masters in Industrial Engineering there. After getting my Masters I thought ‘This is it, I have to experience and explore the world’. So I moved to Canada and started my graduate studies in Mechanical Engineering at the University of Calgary (U of C). At the time, it was a little bit difficult to get the admission from Iran, not difficult… it was different, (if you did not know anybody here, which was the case for me) because you didn’t know what you were going to work on. Unfortunately, my project was not quite what I was looking for, or expected. It was an experimental work which did not satisfy my engineering soul! We were trying to investigate the impact of training mode and learning styles of individuals on their performance for a wide range of task complexity. Using some statistical tools and indexes and matrixes that we developed, we studied the interactions between these variables (training modes, learning styles, and task complexity) and investigated the impacts of training modes on human error rates, considering individuals’ learning styles and the complexity of assigned tasks. Maybe I am a bit more of an analytical person, and that is why I did not thoroughly enjoy what I was doing. But as an international student, I had no other choice but to hang in there and do my very best to finish what was started. After my masters, I started my PhD, which was a more informed decision. Simply because I was here I had a chance to explore research areas on campus and meet and talk to professors. Tell me about your PhD. So my PhD… it was actually very interesting and at the same time very challenging. I had three supervisors from various backgrounds and different departments with totally different perceptions towards research objectives. The first one, which was my main supervisor, was in mechanical engineering, with a background in supply chain management and operations research. My co-supervisor was in chemical engineering, her background was in life cycle assessment, and the third one was in business school focusing on decision making and risk analysis. Research had to tie into all of their backgrounds and satisfy all three of them simultaneously. It was kind of interesting and sometimes impossible! I developed a multi-objective game-theoretic model to study the behavior of players under competition in the natural gas market market, while minimizing cost and emissions simultaneously. I mainly focused on China because it is one of the biggest natural gas consumers in the world. It was interesting for us because Canada was one of the potential natural gas exporters due to the huge resources and reserves here and the proposed Kitimat project, which would be critical in transporting liquefied natural gas assumed to be exported to east Asia. The research objective was studying the economic and environmental implications of replacing coal in China with natural gas for electricity generation in a competitive market. With my game-theoretic model I was able to find the production level at equilibrium for the exporters under competition to meet Chinese natural gas demand. Results were really good and reasonable (in terms of practicality and applicability), which caught the attention of some oil and gas companies (including TransCanada) at a conference in downtown Calgary. That’s valuable information for oil and gas. I can’t believe how lucky we are to have you at Skymatics! I am definitely happier here at Skymatics. Did you do schooling anywhere else before coming to Calgary? Once when I was in high school, and once in my undergrad, I attended a summer school in the UK. My father sent me because he really wanted me to improve my English. It was not very successful though. I was very young and did not take advantage of that opportunity the way you hope you would. Did you speak english before you went to the UK? A little bit. I knew the grammar. Unfortunately, it was all we learned in Iran. We know grammar very well, maybe better than native speakers, but when it comes to speaking and conversation we fail. I could speak English, but not really well. I would say I learned English here in Canada. Is it common for fathers to send their daughters to do something like that? Not at all. Especially not in those days, when I was a teenager (that was like 10–15 years ago) it was not common at all. I was always a good student, so maybe my father thought it could be a good investment? I don’t know. But my Uncle lives in the UK, which made it a little bit easier for my parents. Overall it was a pretty cool experience. I learned a lot (maybe not English, but about different cultures) as a teenager from a middle eastern country. It helped me explore the world and see what other people are like, what they do, and how they live. At that time there was no internet, well there was, but it wasn’t as common as now, and nobody knew Google! It was definitely a cool and eye-opening experience. Now you live on the other side of the world. That definitely helped me in making the decision to move here. I knew a little bit of what to expect before I came to Canada, of course it’s still very different from Europe. For one, its very very VERY far from home and very cold. Do you keep in contact with any of your classmates? Most of those friends are in the US. I am still in touch with 3 of them. We sometimes speak over the phone. But I guess we keep ourselves so busy with life and work and there is not much time left to easily keep in contact. You lived in the US too, didn’t you? How does that fit into your story? Well… after getting my Masters degree at the University of Calgary, I got 2 PhD offers, one from the U of C and another from George Mason University in Fairfax, Virginia. In 2011, I went to GMU and studied for 1 semester. But due to the international relations between Iran and the US, it was very difficult for my parents to visit me. So I decided to come back here. It was very difficult, yeah, to move everything to the US and then after a couple of months, moving everything back by myself, it was very difficult. Even besides the physical move, it’s a big life event. Making that choice to move and then a few months later to make that choice again, that would be difficult. I was not emotionally attached to Canada at the time, it took me a couple of years, so that part was kind of easy. Now I think of Calgary as home. How did you choose to come to Canada? You’ve touched on this, did you just apply to a bunch of different places, or was Canada one of your top choices? Actually, at the time the US was my top choice, because there are better universities for my field in the US. I applied to a couple of Universities in the US and 3 in Canada: UBC, University of Calgary, and McGill. Among all of them, U of C gave me the best offer, financially. Transitioning to present day… What are your favourite parts of being here at Skymatics? The fact that it’s a small company and we’re like family. I feel really comfortable here, and I really like everybody working here. It makes it easier to work, to make progress, and to be productive. I am always motivated to work harder and to be creative, because everybody is pretty relaxed, nice, friendly, and there is no politics involved. I can easily speak my mind and make comments without thinking about the consequences! Besides, we are from different backgrounds and cultures, which makes it more beautiful and motivating. Everyday I learn something new just by our casual talks during breaks or technical discussions in our meetings. Moreover, I love how my job is not routine, so I have to think and use my brain more often! The work that you do here, as a data analyst, how does it tie into the work you did at the University of Calgary? What I am doing here is applying a combination of different tools and techniques, such as statistics, operational research, optimization, and machine/deep learning for the purpose of data interpretation, image processing and object detection. I applied all of these techniques to my PhD project as well. So, although they may seem so different, it is basically applying the same set of tools in a different context. You’re creating breakthroughs in image analysis, segmentation, and more. What is your favorite thing you’ve worked on Skymatics? Real-time object detection. It was the most interesting thing SO FAR. Basically, I was given a video and I was asked to detect the objects in the scene with some level of accuracy; I used deep learning for this project. I have been working on constructing our own convolutional neural network and training the system to process images but this was the first successful project (in terms of actually seeing the results). It was very cool to train a system, input a video and then observe how intelligent your model is! I was so proud of my model and its reasonable accuracy. Other than that, what I do every day is also interesting, I work on our crop damage analysis. I developed an algorithm (that we are constantly improving), which predicts healthy and damaged areas with some level of certainty in a raw image and creates a report accordingly. Although there is a long way to go to reach perfection, it is still interesting to see how accurate the results are based on certain theoretic/statistical models. What is also exciting to me is that I have to read a lot, study a lot, and extend my knowledge of the field because it’s rapidly changing. There’s a new tool/technique every day and you have to be updated as much as you can. I am really interested in machine learning and data analysis. I see huge potential in applying them for predictions and making wise and informed decisions in any industry. I really look forward to developing a sophisticated model to improve the accuracy of prediction in our future crop damage analysis. I also enjoy working on the development and optimization of our network; it’s a big project that we are still working on. I am currently in the middle of creating a database based on the maps we have received so far and training our model accordingly. What would you like to change here at Skymatics? I would like to move more! When we work, especially Vadim and I, we are like frozen people in a cave, with minimum signs of life (sorry Vadim…). We don’t talk, we don’t move, we get so focused on work, which is not necessarily a bad thing, but in long run may not be as effective or productive. So maybe those standing desks help! It might sound cliche, but I want to be the best data analyst that I can be. I really want to be the best version of myself because I believe we have lots of potential and we usually don’t take advantage of our full capabilities and capacities. I have to manage my time to read more and study harder to get better every day. I love what I’m doing, I love what this technology is going to do. It has the potential of predicting trends, making decisions, and helping with business development. I want to contribute to this field as much as I can and also learn from it more. The last question is where do you see technology going? It’s definitely growing fast, especially in data science and in the drone industry. To see what drones can do and what data science does with the generated data in a relatively short amount of time is amazing. NASA is developing a drone to be used to explore Mars. To me, it is beyond fascinating and shows that technology and drones will become more and more ubiquitous in every aspect of our daily lives. It also opens lots of doors to finding useful and novel ways of utilizing drones. On the other hand, machine/deep learning is a powerful tool which makes analysis, interpretation, and prediction easy and reliable, especially for a large set of data. I see this as a very common tool in the near future in all business, markets, and industries. Even in our daily life if our brain cannot handle the complexity and volume of datasets! Skymatics is a Calgary-based multi-national company utilizing the latest in unmanned aerial vehicle (UAV) technology. Our team of experts specializes in analyzing aerial imagery captured by UAV’s/drones. We are developing the future of remote sensing and pushing the boundaries of image analysis.